This year I’m starting early with the Christmas knitting patterns. I have tons of new patterns to share and I want to make sure I have enough time to squeeze them all in! 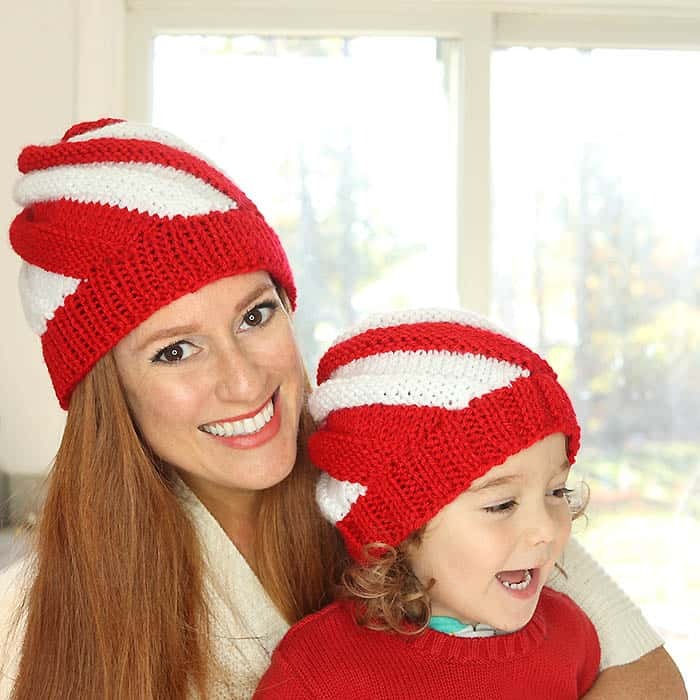 The first pattern of the season is this Easy Candy Cane Swirl Hat Knitting Pattern. They look complicated, but they’re actually really easy to knit. The swirl is created on flat needles with some increases and decreases. When the sides are sewn together it creates the swirl shape. I love Christmas themed hats. They’re fun, festive and perfect for family pictures! Want more Christmas Knitting Patterns? Repeat these 12 rows (switching from red to white yarn every 12 rows) 7 times. Bind off. Pick up the 82 (94) stitches on the bottom using either straight, double pointed or circular needles. Work in K1, P1 ribbing for 3 inches. Bind off. Finishing- Sew the side seam. Using a yarn needle, run a stitch around the top of the hat and pull to gather. Weave in ends.